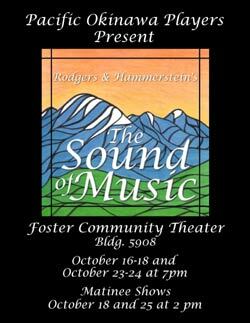 The hills are alive with music this fall in the Camp Foster Performing Arts Center as the Pacific Okinawa Players (POPS) present Rodgers and Hammerstein’s The Sound of Music. The musical runs October 16–18 and 23–24 at 7 p.m. each evening; matinee showings are scheduled for October 18 and 25 at 2 p.m.
Set in pre-World War II Austria, The Sound of Music relates the story of Maria Rainer, a postulant who proves too high-spirited for abbey life as a nun. Dispatched as a governess for the seven children of a widowed naval captain, Maria helps an injured family rediscover the joys of music, harmony, and love. This heart-warming musical also features some of the best-loved numbers from the 1965 award-winning film The Sound of Music. Over seventy individuals have volunteered as cast and crew to present The Sound of Music through POPS. Featuring soloists Kellee LeRoy as Maria Rainer and Todd Hyson as Captain von Trapp and a full choir of abbey nuns and postulants, viewers are sure to witness some of the best voices, theatricals, and choreography on-island. 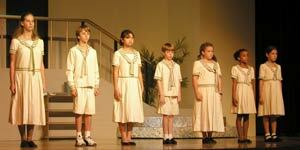 In addition, spectators will also be treated to live musical accompaniment by Camp Foster’s own acclaimed III MEF Band. Tickets can be purchased at the door and are $7 for adults and $5 for children. All shows will be held at the Performing Arts Auditorium in the Community Center on Camp Foster. POPS is a local organization dedicated to promoting the arts within the military community on Okinawa. The group also publishes a monthly newsletter informing its members of upcoming projects and theatrical productions. For more information on POPS, visit www.pops-okinawa.org or email pops@pops-okinawa.org.